Cross-Border Taxation of Permanent Establishments illustrates and compares the OECD Model Tax Convention with country-specific source taxation rules. The permanent establishment (PE) is a legal form of cross-border direct investment whereby a business presence is maintained as an integral part of the foreign investor. Due to the growing intensity and complexity of international business relations, the PE definition and the allocation of profits to head units and PEs have become highly contentious, especially from the perspectives of the major emerging economies of the BRIC (Brazil, Russia, India, and China) countries. Unsurprisingly, the potential for tax avoidance and the scrutiny of tax authorities have increased enormously. Against this background, this work emphasizes the taxable implications of the various rules upon country-specific PE concepts focusing on possible tax system changes and offering reform proposals. the OECD project on Base Erosion and Profit Shifting (BEPS). The author uses simulated cross-border national and treaty cases to highlight qualification conflicts, thus reinforcing his detailed discussion of source taxation rules of business profits and relevant case law in Germany, the United States, and the BRIC states. This book discusses qualification conflicts of PE taxation in cross-border cases and analyses risks of double and non-taxation and increasing complexity. There is also a checklist detailing how companies can avoid unintentionally setting up a PE. The author’s deeply informed proposals provide much-needed guidance in tax criteria and open the way to greater feasibility and transparency in PE taxation. 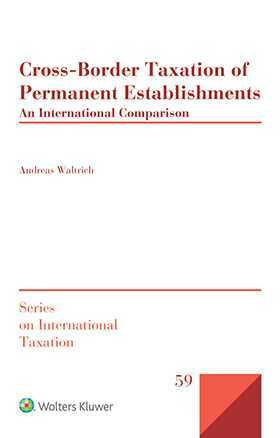 As the definition of PEs has become more extensive and the treatment of profit allocation has become more complex, the clarification of the PE concept presented in this book is of inestimable importance for lawyers, officials, policymakers, and academics concerned with international business taxation in any jurisdiction. List of Abbreviations of Countries. Chapter 2: Fundamentals and Objective. Chapter 3: Source Taxation of Business Profits according to the OECD Model. Chapter 4: Source Taxation of Business Profits from a National Point of View of Germany, the US and the BRIC States. Chapter 5: Cross-Country Analysis of the OECD and National PE Concepts and the Rules on the Attribution of Business Income. Chapter 6: Reform Proposals with regard to the PE Definition and the Attribution of Business Profits. Chapter 7: Final Conclusion in the Form of Theses.